Japanese culture reveres certain flowers and places deep symbolic meaning on many. The Japanese flower arranging technique called Ikebana is tied to Zen aesthetics and design principles in a similar way as bonsai. Flower arranging in Japan is centered around a number of schools, including Ikenobo, Sogetsu and Ohara. Flowers with deep symbolic meaning are often used as the center pieces in these formal arrangements. Chrysanthemums are symbolic of long life and health. A single chrysanthemum petal is often placed on the bottom of Japanese wine glasses. Japanese emperors sit on a chrysanthemum throne. Native to China and Japan, chrysanthemums are cold hardy in the United States Department of Agriculture (USDA) Hardiness Zones 5 through 9. Flower colors include red, orange, yellow, white and lavender. These flowers grow to between 12 and 36 inches tall and perform best in locations that get full sun and have soil that drains well. For fall flowering, chrysanthemums should be cut back three times: In the spring, in the summer, and a final cut in mid-August. This will encourage fall flowering of this perennial flower. The lotus is sacred to Hinduism and Buddhism. As a primarily Buddhist country, Japan holds the lotus to be sacred. The lotus is considered one of the Eight Auspicious Symbols, and is a representation of the Buddha's teachings. Lotus symbolize the progress of the ultimate mind. It grows from muddy depths through the waters of experience and "blooms in the sunshine of enlightenment," according to Religion Facts. Lotus grow from tubers that are planted in the soil underwater. They can grow to a spread of over 10 feet, depending on the variety. Lotus can be white, pink, red or blue. Some lotus can winter over below pond ice, as long as the ice doesn't reach down to the tuber. Azaleas are native to China and Japan. Many of the symbolic references to the flowers are shared between the two cultures. Azaleas are symbolic of temperance, passion and womanhood. A flower bush that is a member of the rhododendron family, azaleas grow best in loose, well-draining soil. They don't do well in constantly wet or compacted soils. They prefer partial sun and grow well in places that are sheltered from direct afternoon sun and drying winds. Some varieties of azalea can grow in areas as cold as USDA Hardiness Zone 6b. 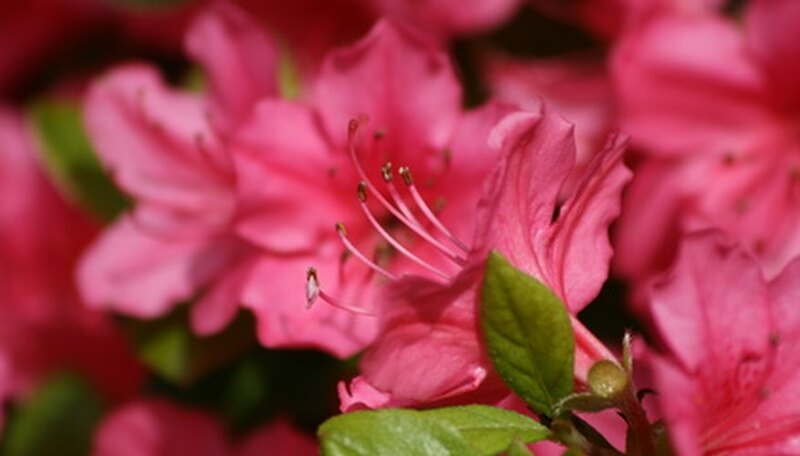 If possible, plant Japanese azaleas in slightly acidic soil. Azalea are popular as bonsai plants in Japan, China and the West. Cherry blossoms in Japan are symbolic of the transience and impermanence of life because they don't bloom for long. The falling of the cherry blossoms also symbolizes warriors who have died in battle, thus connecting the blossoms with the samurai ethos. Japanese cherries grow best in USDA Hardiness Zones 5 through 8. They need moist, well-draining soil and require full sun. They generally flower in April or May.